+We switched Camden to whole milk (we're doing Organic Valley) and no bottles! This was a pretty big change for him (and us!) but he did pretty well at adjusting after a few days. +We did get around to picking out paint samples this weekend for baby brother's room! And we think we've got a winner! +Our big anatomy ultrasound is this week. Other than finding out the gender (which we already know obviously), the doctor will be taking many measurements and looking at baby's brain and heart. Praying for all good news! Sidenote: I can't believe I'm already 18 weeks! +I've fallen in love with a vacuum and it's called the Shark Rotator. Who else loves this amazing little machine? And no, I don't even care how old I sound right now...this thing makes my life so much easier, ha. 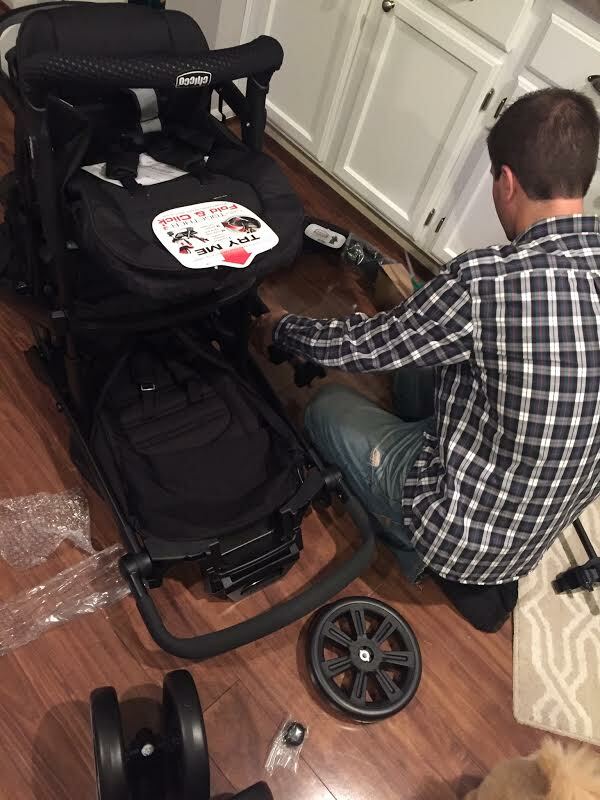 +Billy put together our double stroller last week, which made everything seem so much more real! We went with the Chicco Cortina Together and LOVE the look and style of it. It is a tandem double stroller so it goes front to back vs. side by side, which I really wanted. The quality is great too - sturdy but still easy to maneuver. The price point is attractive too! I will post more about it soon. 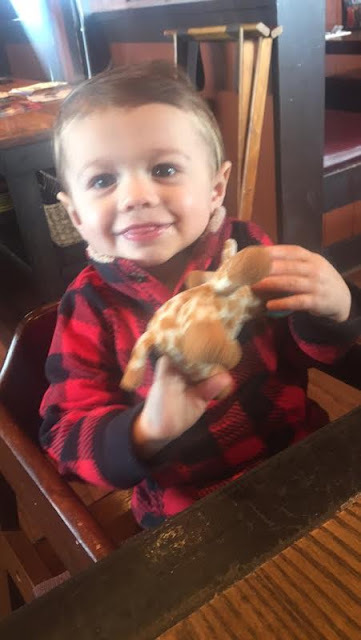 +Took Camden to Uno's last weekend...I think he's going to be a pizza fanatic like his Daddy! Although he seriously loves ALL food - he eats so much!! Speaking of the litte man, he just got molars in and is talking up a storm recently! His newest favorites are yeah! and whoa! +Gymboree and Target have the cutest spring (and some summer) kids clothes out right now! 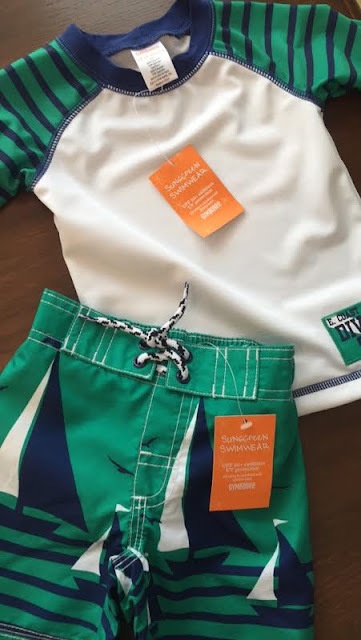 I couldn't pass up these adorable swim trunks and rash guard (which are 40% off right now) They have some other colors/styles too that are really cute! +Billy's brother and fiance are coming to visit this weekend and him and his brother are going to put together baby boy's crib and dresser! We just got them in the mail but they've been sitting in the boxes taking up space in my office...super excited to get them set up! +It's going to be really hard to not share his name for the remainder of this pregnancy...I've already almost slipped twice during this post alone. I think that concludes the most random blog post ever. Happy Bachelor Monday everyone! Total JoJo fan over here! ...you're excited about a vacuum. ...your weekends include putting together furniture, and you're looking forward to it! HA YES! I'm so lame..
Wow! You sure know how to motivate a pregnant lady! I need to go check out your stroller as we haven't even looked at doubles yet. I do know that I want a front to back one as well, so maybe yours is a good option for us! What crib did you go with this time around? We haven't bit the bullet on that one yet. Also, we are going to Florida in a couple of weeks and I was curious about the bug spray you used in while you were in Mexico if you don't mind sharing! We are still struggling with names... Colin and Henry are 2 of my favorites right now, but I don't think we'll end up going with either of those. Hope you have a great week! Camden is getting so big. 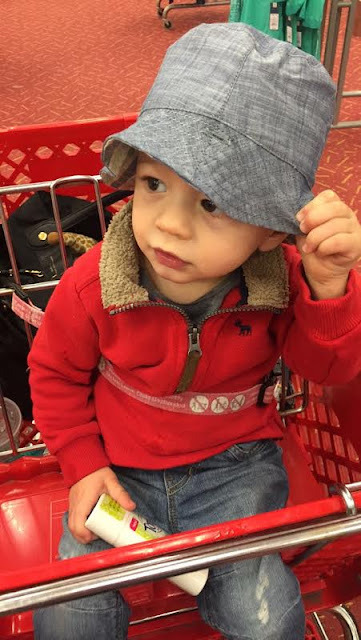 I love that little bucket hat- just too cute. I have that same vacuum and love it as well! Definitely will have to look into that stroller, we haven't even thought about double strollers yet and I'm still hesitant to buy one since Lucy will almost be 3 when baby #2 is born (but I feel like she'll still need to be in one on trips to the zoo, longer walks, etc.) Enjoy your anatomy scan! It's always so much fun to see baby since there are so few chances to do so. We have ours tomorrow and will find out the gender!! I knew I was old when I contemplated asking for a new vacuum for my birthday!